Home / AirAsia / THE FINAL AIRASIA FREE SEATS** SALE OF THE YEAR IS HERE WITH 5 MILLION PROMOTIONAL SEATS! 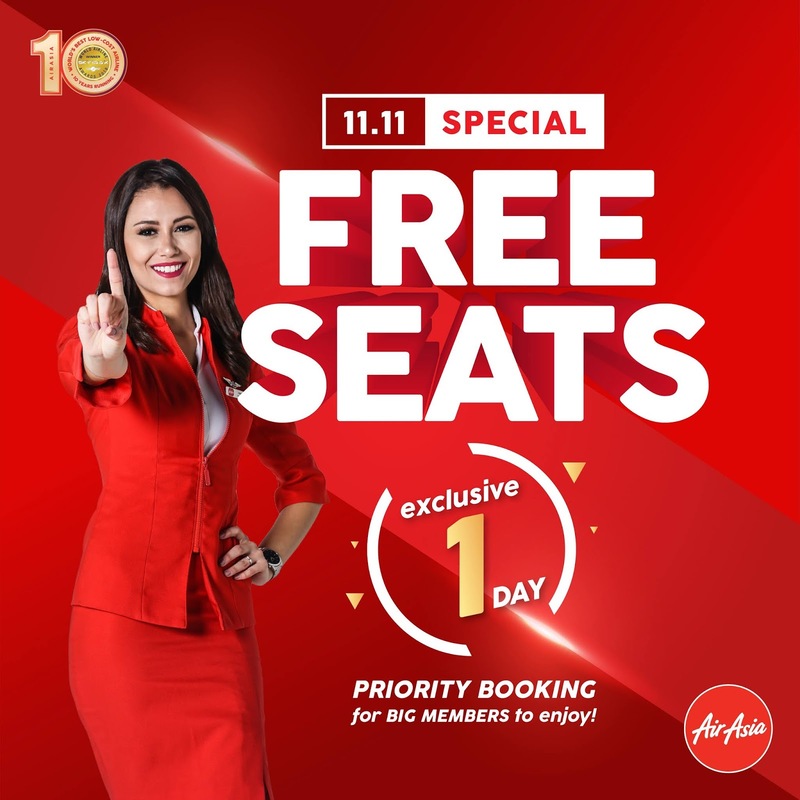 THE FINAL AIRASIA FREE SEATS** SALE OF THE YEAR IS HERE WITH 5 MILLION PROMOTIONAL SEATS! Enjoy promotional all-in members fares from RM15* for flights from Kuala Lumpur to exciting destinations including Alor Setar, Johor Bahru, Kota Bharu, Kuantan, Langkawi, Penang, Kuala Terengganu and Miri, and from RM39* for flights to Asean destinations including Brunei, Phnom Penh, Padang, Jakarta, Surabaya, Ho Chi Minh City and many more. Those travelling on AirAsia X will also be able to enjoy all-in members fares from as low as RM199* from Kuala Lumpur to Amritsar, Xi'an, Chongqing, Melbourne, Taipei, Seoul and Osaka, or fly with extra comfort on the award-winning Premium Flatbed from Kuala Lumpur to Jaipur, Jeju, Hawaii, Sapporo and Busan from only RM899*. AirAsia BIG Members will enjoy 24-hours priority access to the promotion on 11 November 2018 (0001h GMT +8). Non-members can book our promotional seats starting from RM20* from 12 November 2018 (0001h GMT +8) to 18 November 2018 (2400 GMT +8). Bookings can be made on airasia.com and the AirAsia mobile app for travel between 6 May 2019 and 4 February 2020. Fly with more perks when you pre-book our Value Pack. This value-for-money bundle comes with 20kg baggage allowance, one Santan inflight hot meal, standard seat selection and travel insurance by Tune Protect, including 1-Hour On-Time Guarantee and Baggage Delay protection. BigPay users will enjoy zero processing fees and discounts on pre-booked inflight meals and check-in baggage when paying with their BigPay card, while guests who book with the AirAsia Platinum Credit Card will earn bonus AirAsia BIG Points. Using the BigClick payment feature, guests can avoid the hassle of reentering their card details every time as BigClick allows members to securely store their credit and debit card details. Save your card details now and earn 100 AirAsia BIG Points. ** Free Seats are for BIG Members only to enjoy zero base fare. Seats are limited and may not be available on all flights, all destinations, public holidays, school breaks and weekends. Free Seats exclude airport fees and other fees. A payment processing fee is applicable to all payments made using direct debit, credit, debit or charge cards. Our other terms and conditions of carriage apply. * All-in fares including taxes and fees. Terms and conditions apply.